CM Magazine: The Beautiful and the Cursed. The Beautiful and the Cursed. Toronto, ON: Doubleday Canada, 2013. Vander had only just grasped the bottle with understanding when another pair of obsidian wings hurtled into the vineyard row and collided with the second hellhound. The impact drove the hellhound into the ground, its back plowing a rut in the grass. Of course! One was Constantine's gargoyle, and the other was Luc. But the two gargoyles were nearly identical, each one dark-winged and dogheaded. Ingrid looked between the two. Which was Luc, and which was Monsieur Constantine's gargoyle? The first gargoyle was still struggling with the other hellhound and seemed to be losing. The hound worked the gargoyle beneath its massive paws and slashed at a wing with one of its slanted bottom fangs. Black liquid spewed from the gargoyle's wing, and its anguished screech rent the air. "Luc!" Ingrid screamed. A mistake. The hound whipped its lantern eyes toward her. Without hesitation, Vander tore through the wrecked trellis to distract the demon. At the same moment, Gabby shoved away from Ingrid and started for Nolan's prostrate form. Ingrid practically ripped the sleeve of Gabby's dress as she flung her sister behind her. "Stay back!" "But the sword!" Gabby cried. The silver blade gleamed beside the rut the hellhound's back had carved into the grass. Ingrid released Gabby's sleeve and lunged for the ebony hilt herself � she couldn't let her little sister attempt to fight this beast. Ingrid enclosed the smooth ebony in her fist and lifted the silver blade, surprised by the weight of it. Down their vineyard row, the second hellhound batted the new gargoyle away with a strike to its doggish head. The hellhound reared back and charged toward Ingrid. She raised the sword with both hands and held it out before her. A sudden current of electricity traveled through her arms, into her hands, and then, as if it had nowhere else to exit, streamed from the silver tip of the sword as a white flare of lightning. The bolt struck the hellhound in the chest just as Ingrid's back hit the ground. She lifted her head in time to see the beast burst into a cloud of emerald cinders. Ingrid Waverly, 18, and Gabby, her younger sister, find themselves in 1899 Paris when their mother decides to follow her dream and open an art gallery in an old abbey. Paris is quite different from their native London, and they are alarmed to learn that a killer who apparently attacks only young women is on the loose. To make matters worse, Grayson, Ingrid's twin brother who arrived ahead of his mother and sisters, is missing. The authorities seem to think that Grayson has simply decided to make the most of his time as a young bachelor in Paris and the family needn't worry about his whereabouts. However, his sisters are determined to find the truth, and Luc, a handsome servant, is willing to help them Little do the girls know just what they will face during their search. They have no idea where their brother might be and, in fact, no idea if someone might have kidnapped him and changed him into something almost unrecognizable. Page Morgan has imagined an entire world structure based on the gargoyles which adorn many old Parisian buildings. Readers encounter members of the Alliance and the Dispossessed, demons, angels, Dusters, hellhounds, and the eerie world of the Underneath. The novel depends heavily on action and plot, with the sisters and their rather unusual allies involved in fights and flights and intrigues of all sorts. A 'willing suspension of disbelief' is needed in order to accept the events of the book, but as all readers know, neither demons nor angels need to follow the rules of logic, and when all else fails, there is always magic as a solution. The characters of the two girls are interesting and enjoyable. Ingrid discovers she is not as cold and unfeeling as she thought, and, in fact, there is a love interest between Ingrid and Luc as well as between Ingrid and Vander. She is also very tuned to her twin, and throughout the novel knows that, although he is in danger, he remains alive. Gabby is much more fiery and impetuous than her older sibling, willing to take risks and enjoy adventure. Her verbal spars with Nolan begin as nothing more than that, but later in the novel there are romantic sparks there as well. Luc and the other gargoyles are known as the Dispossessed, and their chief function is to protect the humans assigned to them. The antics of Ingrid and Gabby make Luc a busy and heroic gargoyle indeed! Although the novel is historical and set in Paris, this plays little or no role in the action. The horses and carriages reflect the time, as does the clothing worn by the girls and what seems to be old-fashioned etiquette regarding what females can and cannot do. However, the historical era plays no other important part. Aside from naming a few streets and areas of Paris, the novel could be set almost anywhere. There are gargoyles in Paris, certainly, but they are not restricted only to that city. The novel will appeal to young female readers who will be drawn by the cover of the book as well as its title. 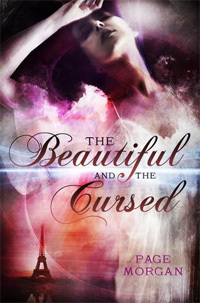 There is plenty of action as well as plenty of romance so readers will enjoy both aspects of The Beautiful and the Cursed. The two sisters are strong-willed and courageous in the face of adversity and so have a great deal of appeal. In the world of demons, hellhounds and shape-changing gargoyles, almost anything can happen so some inconsistencies in the plot become less problematic. The last lines of the text, "Ingrid would need to know how to protect herself, too, because Axia wasn't gone. She'd be coming back for her blood. And the next time they met, Ingrid would be ready" clearly indicate that Page Morgan and her interesting Parisian cast of characters are very likely to return in another volume. Ann Ketcheson, a retired high school teacher-librarian and teacher of English and French, lives in Ottawa, ON.